The villains in this are fairly bland; Arius seems to have no real personality outside of power hungry and is a little insane. The big bad Argosax is the real let down of this game; it’s some kind of featureless fire creature which keeps switching gender, which could be interesting, but it just feels underwhelming. Even if your character is intentionally emotionless, at least follow it up with something…. Anything! There’s also one aspect of the game that really bugs me; there’s a scene of Dante falling from a building head first early on, which was even used in the trailer and looked pretty cool. But then they proceed to repeat the same stunt no less than three times! No variation; clearly this was the pinnacle of set pieces! Gameplay is the real irritation however; everything feels so loose, like you’re not making any real contact. There are a few new moves, like multidirectional shooting and wall running, which are difficult to pull off and are barely worth using, though they did pave the way for the style system used in future games. The gunplay this time is too overpowered; I know that I complained that it was the opposite in the previous game, but this is too far in the other direction, and at least swordplay was fun in the first game so you didn’t mind and had something to fall back on. Here there’s no real reason to do anything other than hold down the fire button. When it comes to the weapons we get to see just how lazy the design time got; you have a choice of a medium, light or heavy weapon. That’s it! The first game at least had a variety; the Ifrit gloves felt different and there was a distinct difference in how they were used. Devil Trigger is interesting this time; you can equip different items to either make you faster, stronger or even fly when it’s activated, which does help with some of the puzzles. In any other game this would be cool, but here it’s surrounded by so much that just lets you down again. Lucia gets her own story mode, though her moves very similar to Dante’s. With that said she does have different animations, using small daggers to fight and throwing knives instead of guns, so it does mix things up slightly. The enemies are beyond uninspired; they are just a series of cannon fodder with little to distinguish them. 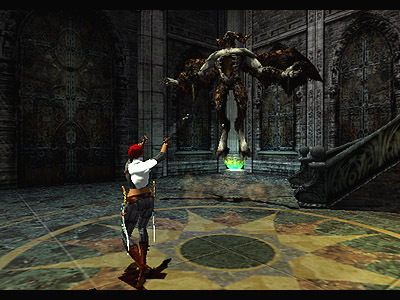 In the first game each enemy had personality, even with the weakest enemies. And they still had a variety of different enemy types of the same enemy, like a stronger puppet like enemy which used a pair of giant scissors, or the strongest version which uses scythes. And the bosses are no exception. No strategy, just shoot. They even recycle the lava spider from the first game; are you that devoid of ideas that you have to use the exact same enemy, only easier? The first form of Argosax is the cream of the creatively bankrupt crop; a being with heads representing each of the main bosses, which only uses one of their attacks. This gets especially ridiculous when some of the heads only use melee attacks. So my strategy came down to taking out the ones that used ranged moves, then firing at the guys who used melee outside of their range. I even resorted to resting a book on the fire button and left to do something else; if I can beat your stupid final boss by literally doing nothing, then maybe you should try again! 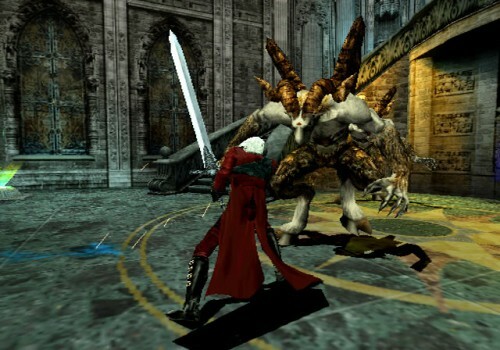 This entry was posted in Uncategorized and tagged Capcom, Dante, Devil May Cry, Playstation, Resident Evil, Video Games. Bookmark the permalink.